When Yellowcard call it a day at the start of next year, it’ll be their 20th anniversary as a band. It makes the realisation of their breakup all the more bittersweet; after all this time, and after such a constant stream of releases, one of the paragons of early 2000s pop-punk will be no more. But then again, therein lies the answer, with Yellowcard being essentially part of the furniture at this point without another real smash to capitalise on the success of their 2003 album Ocean Avenue. But even after being seen as a mere relic by some, the UK leg of their farewell run has shifted a serious amount of units, so clearly there’s still some love for the Floridians after all this time. Speaking of pulling power, that’s something The Kenneths  will have in spades before long. It’s not hard to see why either; Hollywood and New Bad Habit are the sort of scruffy, poppy shots of punk that virtually anyone can get into, and frontman Josh has the sort of effortless magnetism that comes from a truly great frontman. They may not be winning over everyone quite yet, but for as tight of a unit as they are (especially surprising given that drummer Aicha is playing with a broken foot), that’ll only come in time. The same, however, can’t be said of Normandie . Their Linkin Park-meets-Sleeping With Sirens alt-rock is workable on paper, but on a stage like this it gets well and truly lost, broken down into a formless bluster where only the slightest hints of melodies can be made out. Philip Strand’s vocals prove another problem too, with him unable to hit the moments of pure power that are present on record, or with his mic just cutting out altogether. It means that the only real songs that stand out are Awakening and Collide, which do clear up to let the band once again take control. Chalk it up to an off-day, but it’s unfortunate that Normandie suffer so greatly because of it. But then again, the only thing that most people are here for is Yellowcard , and a final chance to celebrate the career of one of pop-punk’s survivors. That seems to be the mindset the band go for too, with a mammoth 23-song set spanning almost the entirety of their two decades. That also means that some duds slip through the cracks though, namely Lift A Sail and a thudding Transmission Home that’s crying out for some life to be injected into it. But like Yellowcard’s back catalogue on the whole, the hits vastly outweigh the misses, and it’s surprising just how thorough this examination of their history is. There are a couple of deep, deep cuts thrown in here, particularly their contribution to the Spider-Man 2 soundtrack Gifts And Curses, a song they’ve played less than fifty times in over a decade. But of course, it’s a set bolstered by fan favourites and the biggest songs of their career, and while this is the last time many in attendance will hear them live, there are no shades of sadness here. Other than the slow-burning Sing For Me and the gorgeous acoustic-and-violin frailty of Empty Apartment, Yellowcard are at full throttle all the way through. There’s a surprisingly hefty guitar crunch in the likes of A Place We Set Afire and Holly Wood Died that’s entirely welcome, and their poppiest material still has its punch and zeal too, with Way Away, Always Summer and Awakening all accompanied by the hugest of huge singalongs. There’s such a sense of community here that only a band with such a solid fanbase and illustrious back catalogue can muster, and nowhere is it more evident than in the closing duo of Only One and Ocean Avenue, the former being a power ballad that’s bound to be the cause of at least some sore throats the morning after, and the latter being the most audacious jewel in Yellowcard’s crown as the pop-punk classic it rightly deserves to be. There have been better shows this year, but few have been as enjoyable as Yellowcard’s; their two hours onstage flies by, and the level of quality on show puts paid to the notion of them being “just a nostalgia act” or “a one-hit wonder”. 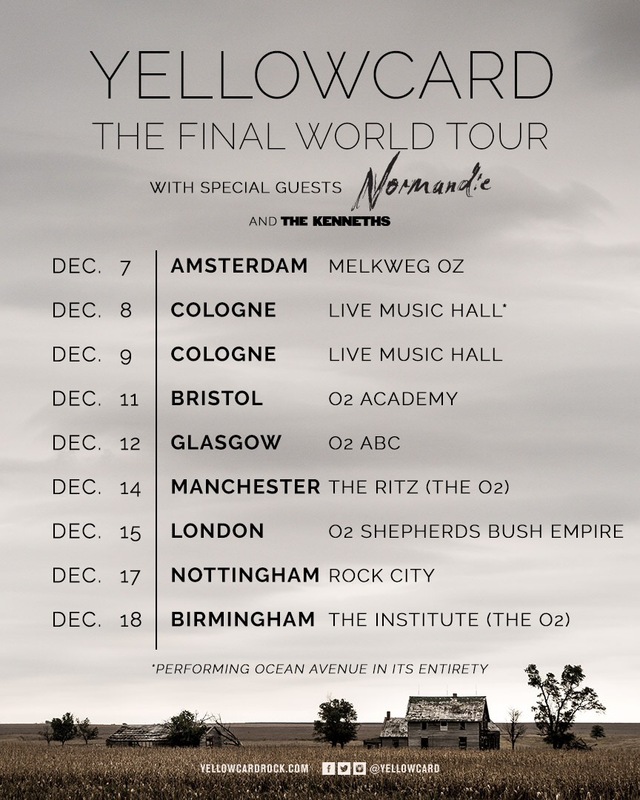 If this really is Yellowcard as how we’ll see them for the last time, then what a way to go.